Marian Bantjes’ Saks Want It!” typography design creates accessories and fashion apparel using lettering. It was created for window displays and other promotional items such as shopping bags. It was posted in her online portfolio. (Marian Bantjes, Saks Want It!, http://bantjes.com/work/saks-want-it/, 2007). “Saks Want It!” is a commissioned piece created by Marian Bantjes for Saks Fifth Avenue. 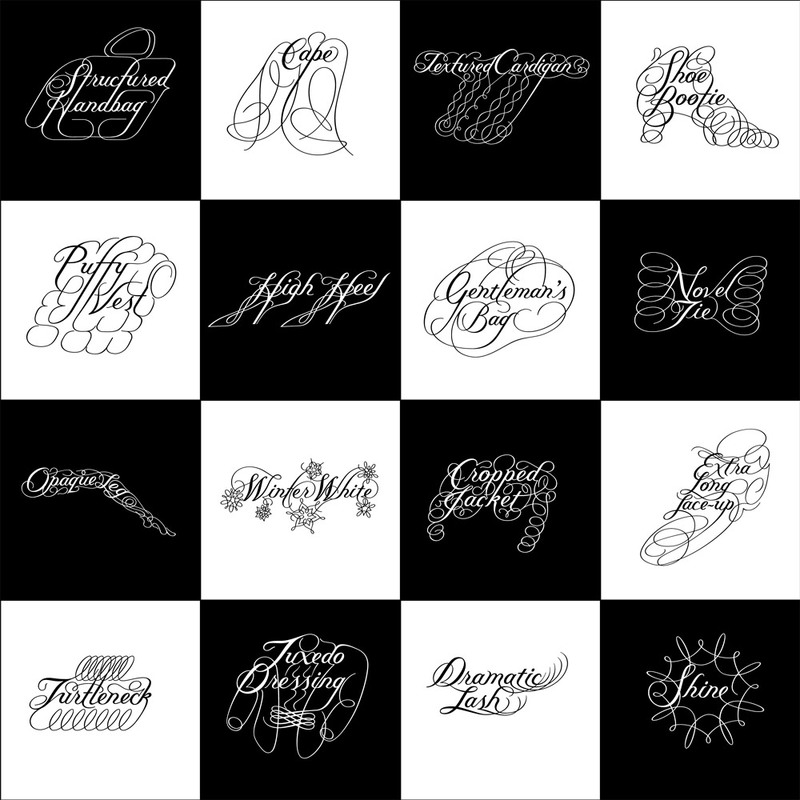 The collection uses intricate typography to create the silhouette of fashion items. The collection is for Saks Fifth Avenue but also is aimed at potential customers of Saks Fifth Avenue. The objective is to grab peoples attention while also drawing consumers into the store. Through the unique design, it tells customers not only what to expect inside the store but encourages them to use their imagination to interpret Bantjes “personal” designs. Formstorming is an act of visual thinking, and Bantjes’ work is an excellent example of that. Formstorming breaks down problems into ingredients or puzzle pieces. When thought about critically they can be put together to solve complex problems. This design concept can be practiced by repeating a concept with several different designs, practicing something new each day, or taking a step back and breaking down a visual design into several unique pieces. “Saks Want it!” is a perfect example of formstorming as each tile of her designs builds on the same concept of text creating silhouettes. Each design is very different, showing a wide variety of approaches to the idea. Modularity is creating constraints for a project and using only those rules to piece together a design. This method creates specific pieces that must be used purposefully to create a cohesive design. In the “Saks Want it!” example the constraints are the use of only lines and text to create the objects. The lines must be thin to match the font, and the text must mirror the shape being created. For example, the word “cape” has been transformed into the shape of a cape using thin lines that match the font. There is no color in this piece (there are colors in the independent advertisements), increasing the constraints. Lastly, in this photograph, each block of white or black is a module making up the entire image. Each tile has constraints (it must be black or white in a specific pattern) and is used to make a larger image.